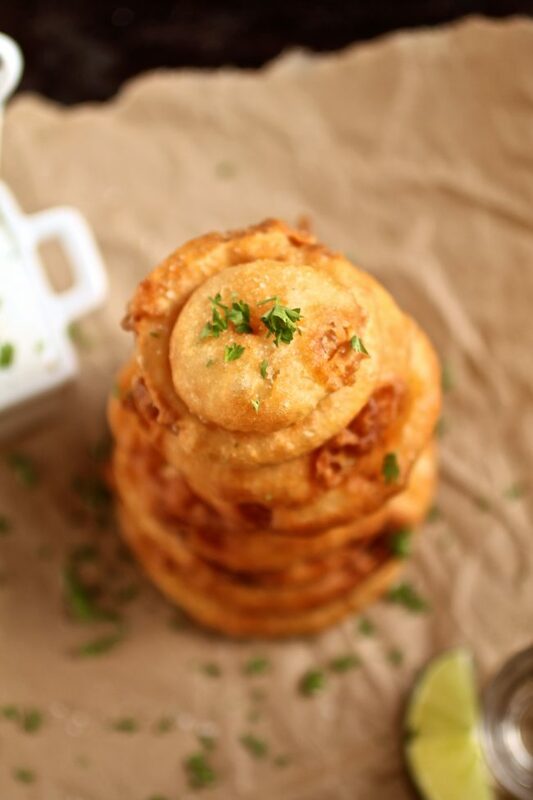 These homemade onion rings have a rich tequila batter and are sure to be a hit! Add the honey lime yogurt dipping sauce and you’ve got a perfect pair. A few weeks ago, Kyle had a super brilliant idea. And it was this: TEQUILA WEEK. 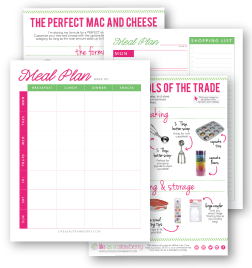 After the super success of Mac and Cheese Week, I’d been wanting to attack another recipe theme for a few months but went back and forth a billion times trying to decide on what the theme should be. Fortunately, Kyle is smart. And came up with this rock star plan. And selflessly offered to taste test all Tequila Week recipe contenders for me. What a guy. But seriously. WELCOME TO TEQUILA WEEK, FRIENDS! It’s going to be amazing. I went through a whole bottle of tequila while I was working out the recipes. Just for you guys. Because I care that much about you. And tequila. PS – I like to think that I’m a really good speller, but does anyone else have those days when they say or type a word so many times that it starts to look totally foreign to them? Because I love tequila and drink it often (not TOO often, Mom and Dad, don’t worry) but I definitely just had to Google it to make sure I was spelling the thing right. But Google backed me up. And here we are now. Victorious spellers who are on the brink of the greatest week ever. Maybe I’ll make a cheer. About tequila. That I can cheer. By myself in my kitchen. While I drink tequila. Maybe Kyle will cheer it with me. But more likely he will just laugh at me and walk away. I guess maybe I should tell you about these onion rings. And there is a whooooole lot of tequila in the batter. Yes, they’re fried, but the greek yogurt honey lime sauce is light and bright, which helps balance out the fried-ness. The sauce is tangy (as greek yogurt sauces are prone to be), so if you aren’t a fan of greek yogurt I’d recommend switching it out with regular plain yogurt. You could also use mayonnaise, if you’d prefer, but I have a truckload of Chobani in my fridge that just keeps calling my name. But for real: these onion rings are pretty bomb. And I think they are a most excellent start to Tequila Week. Stay tuned for another boozy recipe comin’ atcha tomorrow! Stir together the milk, apple cider vinegar, and tequila in a large bowl to form a buttermilk-like mixture. 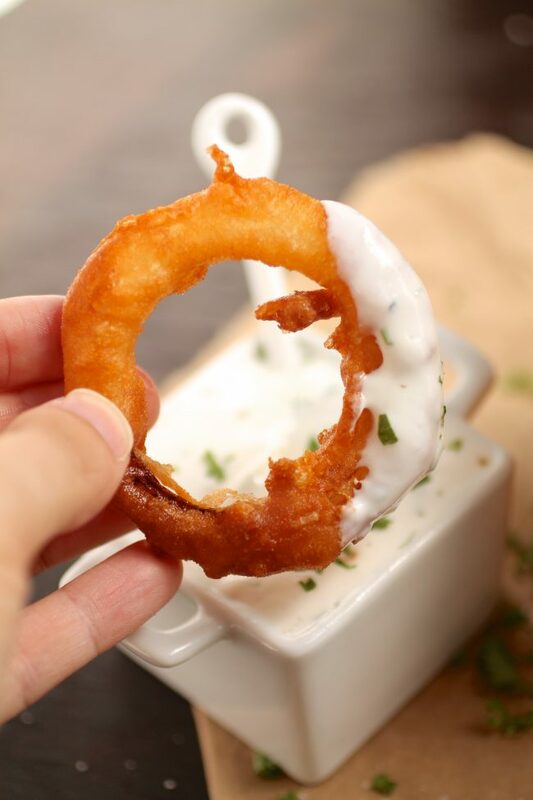 Submerge the sliced and separated onion rings in the buttermilk mixture and refrigerate for at least 1 hour (I like to pop them in the fridge while I get the rest of the stuff ready and heat the oil, but you could leave them in for several hours if you’re making them in advance). Whisk tequila, milk, salt, and 1 cup of the flour together to form a batter. Set aside. Place the remaining 1 cup flour on a large plate or platter and set aside. Whisk all ingredients together in a small bowl. Store in the fridge until you’re ready to serve it. Heat the 6 cups of vegetable oil over medium-high heat in a large, sturdy pot. (I used my Le Creuset) It will take 20-30 minutes to heat up, depending on the size of your pot. Test the oil after 25 minutes by flicking some flour into the oil. If it sizzles, it’s ready to go. If not, wait five minutes and test it again. When your oil is hot, line up your onion rings (still in the buttermilk), plate of flour, and tequila batter to make a little battering/frying station. I also like to have a plate ready with a few paper towels on top, to drain the onion rings once they’re fried. 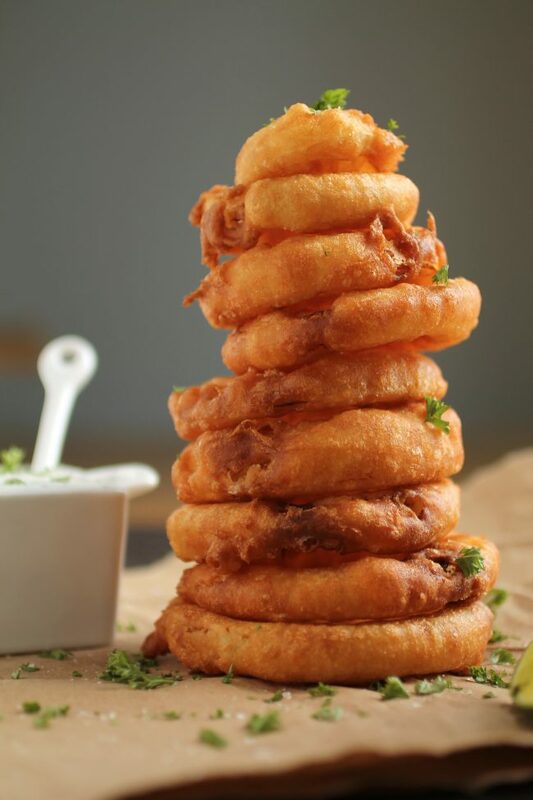 Pull onion rings a few at a time from the buttermilk, shake off the excess, and dredge them in flour. 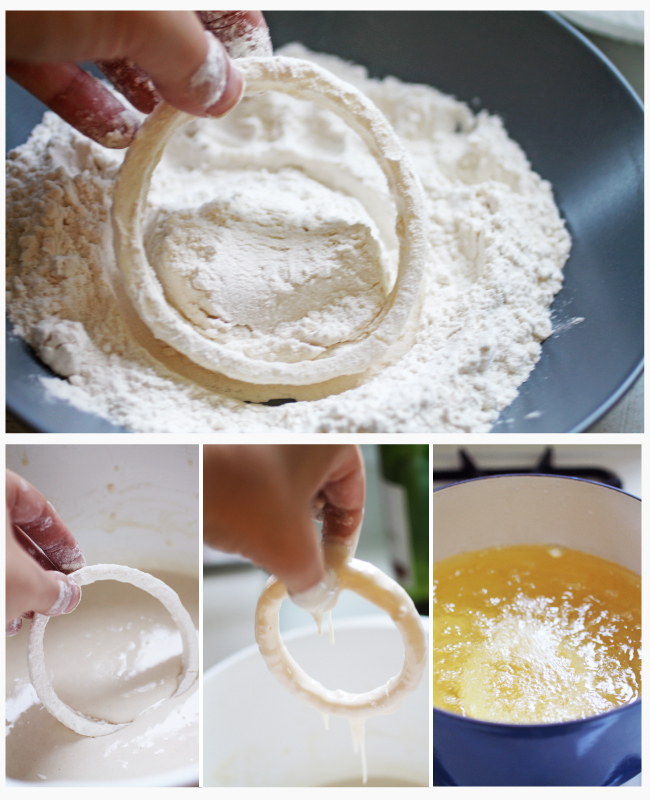 When the rings are covered in flour, transfer them to the tequila batter and turn to coat them completely. 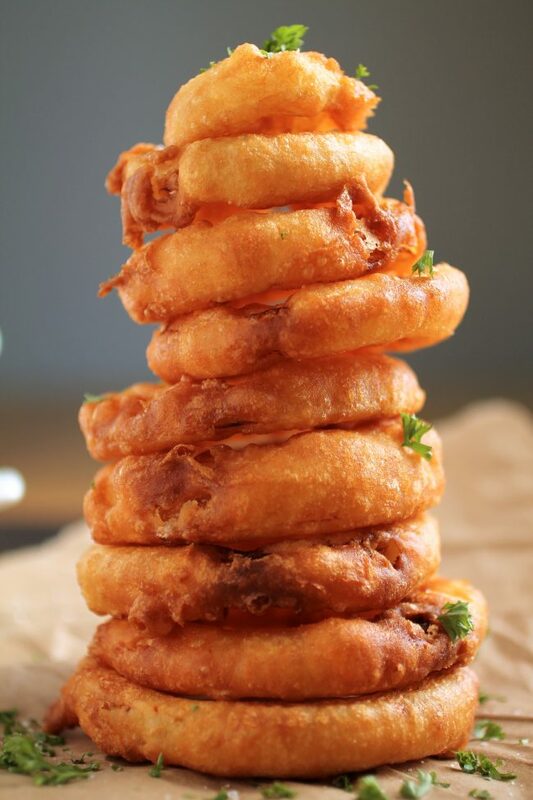 Shake off any excess batter and gently place the battered rings in the hot oil. Put rings in oil one at a time, to allow the oil to come back up to temperature for a few seconds in between each addition. I like to fry 4-5 large rings at a time (6 or 7 if they’re small). 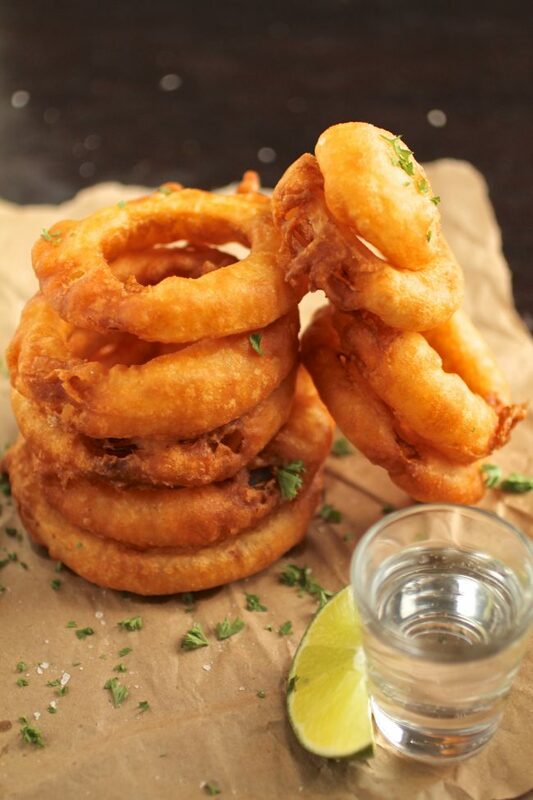 Fry onion rings for 3-4 minutes on each side until they’re a deep golden brown. 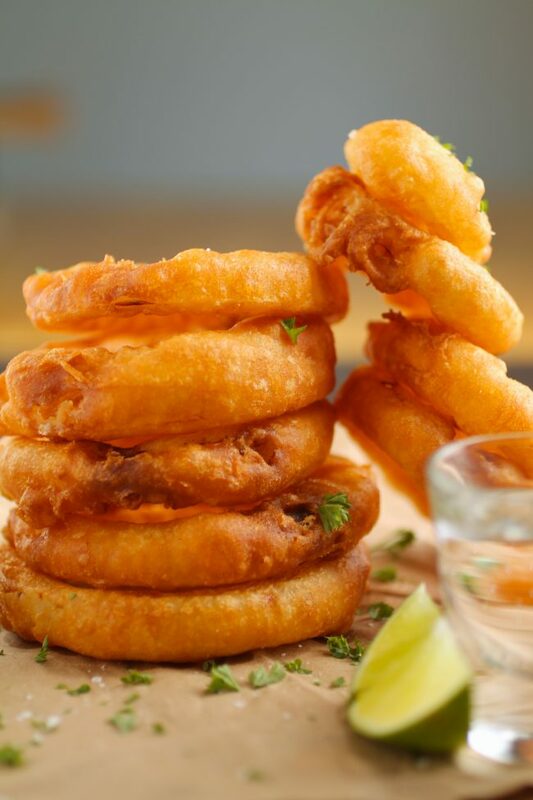 Remove fully cooked onion rings to a paper-towel lined plate and repeat the battering & cooking process until you’ve fried all of your onion rings. 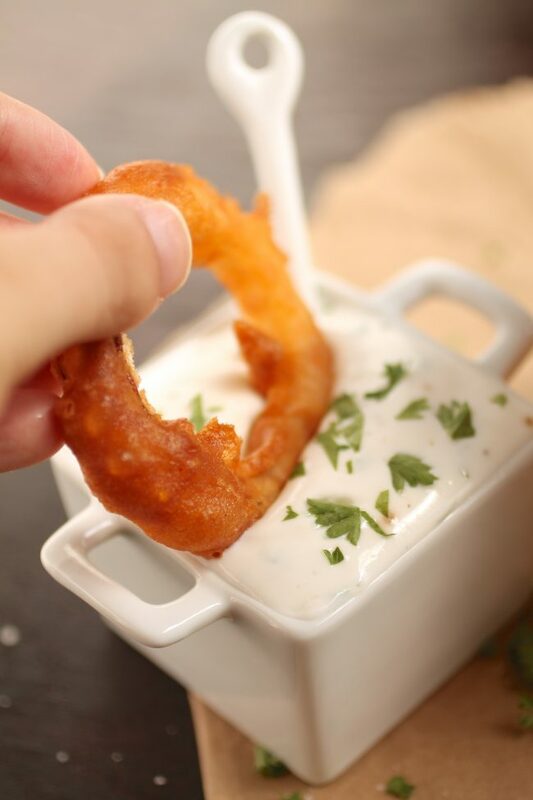 Serve onion rings immediately with Honey Lime Yogurt Sauce (recipe above) on the side for dipping.